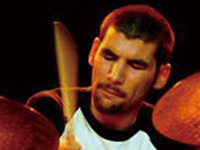 Bernd started playing drums at the age of nine. He began playing marching music in orchestras and big band music, later in his youth started to experiment with smaller groups. At the age of fourteen he won “jugend musiziert” and two years later finished the competition “Best European Youth Drummer” during the “Super Drumming Festival” in Lahnstein in third place. In 2000 he took part at “jugend jazzt” and won several Band prizes with the Quintet “F.A.T.” and a soloist prize. He studied jazz music at the Folkwang Hochschule Essen from 2002 and became a highly requested musician on the scene. During that period Bernd also started to work with dancers and actors, he recorded music for dance and theater in Germany, Austria and Switzerland. He won the “JazzWerkRuhr Preis” with the bands “Ohne 4 gespielt drei”, “Matovs Garage”, “Zodiak Trio” and “Invisible Change”. Since 2002 he is working with Gunter Hampel, touring and also holding improvisation and dance workshops for kids world wide. Over the years he played and worked with Gunter Hampel, Perry Robinson, Rupert Stamm, Matthias Schubert, Steve Swell, Daniel Carter, Sabir Mateen, Florian Weber, Embryo, Randy Brecker, Michael Gibbs, Uri Caine, Bart van Lier, Dieter Glawischnig, Nyguen Le, Gerd Dudek, Angelika Niescier, Philipp Schug, Frank Wingold, Ulla Oster, Dan Weiss, Rudresh Mahantappa, Wayne Krantz, Eric Revis, Jorge Sylvester, Norah Mc Carthy, Elliot Levin, Sven Decker, Dave King, Dave Douglas, Gunnar Plümer, John Taylor, Markus Braun, Ingo Marmulla, Katrin Scherer, Kenosha Kid, Oliver Maas, John Dennis Renken, Andreas Wahl. Johannes Schleiermacher, Sebastian Räther, Veit Lange, Andreas Lang, Roland Gebhardt, Gabriel Coburger, Thomas Siffling, Denis Gäbel, Andy Lutter, Henrik Walsdorff, Jan Roder, Antonio Borghini a.m.o. My first hit on a canopus snare and I was in love with that drums. looking for a different sound wich hardly exist today anymore.